I received an e-mail the other day asking for some suggestions, and I wanted to get some recommendations from those who stop by. Please help Nancy with some options that will work well for her preferences. Thank you! "I'm going to be starting law school in August, and since I'm one of the rare people who focuses better while taking notes with pen and paper, I would love some good pen recommendations. I prefer ballpoint (but am not opposed to a good quick-dry ink pen) and something not too thick (sorry, Schneider Slider XB) but really what I'm looking for is smoothness, consistency,and comfort. While I normally go for the regular old cheap ballpoints since they get the job done, I want something more durable that I'm not going to have to worry about crapping out on me (until the ink is gone). Hopefully I'm not being too picky..."
So, what does everyone recommend? After seeing my post on the Schneider Memo XB, Stride, Inc. reached out to me to see if I'd be interested in sampling additional Schneider products, so I obviously jumped at the opportunity to see what else Schneider has to offer. Thanks to Stride, Inc., you will start seeing Schneider products in some of the big box retails stores, such as Office Depot and OfficeMax. Given the stagnant selection typically found in the larger retailers, new options are certainly welcome. So, what is the Schneider Xtra Document? "Ink roller with conical tip made of stainless steel and innovative liquid ink technology. Waterproof ink according to ISO 14145-2. The Xtra ink regulator controls the ink flow exactly and consistently from beginning to end, without blots or interruptions. The large ink reservoir has a level indicator and an ergonomic rubber grip on the barrel of the pen, promoting a tireless and relaxed writing experience. The cap has a high value metal clip." Depending on the paper you use, the line width will be somewhere between .3 and .5 - And, in either case, this is a good thing, especially considering that many liquid ink pens bleed out to a .6-.8+ line width. In terms of fine point pens, Japan tends to excel at producing clean, sharp lines in the micro tip category and, based on my experience, Germany is likely second in line for producing high-quality pens with precision writing, though this may be subject to debate (please comment if you feel differently). The fact that these pens are becoming more popular in the U.S. retail environment is huge; normally we are stuck with a very narrow margin of options, and I can only hope that consumers of fine writing implements create the demand required to change the status quo. As far as the conical tip and rubber grip, both are quite solid in quality and performance. The grip is made of the material that tends to attract dust but, being a capped pen, I think the buildup after a few days of use is fairly negligible. While the pen is not refillable, I think the build quality will easily last through the life of the life of the ink. The description from Schneider notes the "high value metal clip", and I am not quite sure what is meant about the value, but it is solid, aesthetically pleasing, and looks very nice. What more can be said? It may seem flashy, but this offering from Schneider is, apparently, loaded with technology to ensure consistent, satisfactory writing, and everything I experienced with this pen reaffirms that indication. I will soon be posting additional reviews from the Schneider package I received from Stride, Inc.
Last week, I was delighted to find a sample pack of these InkJournal Notebooks in the mailbox. This is a new product from Tom Oddo, creator of the InkJournal and fine-writing specialist at Goldspot.com, which has a large selection of pens, paper, ink, and cartridges. As a pen, paper, ink enthusiast, Tom set forth to create a better tool for testing and organizing ink characteristics and reviews. The key here is convenience and standardization. I often try out new inks in whatever notebook is available, and I usually don't keep the individual pages that I test inks on because they are in different locations. Given my need to be more organized, I think this is an efficient solution to keep track of how different pens (nibs) distribute various inks on the page. Within the 3-pack of InkJournal Notebooks is an instruction card, which also doubles as a blotter card. Though the layout of the notebooks is intuitive, the card is both a nice touch and a helpful aid for those who are new to the terminology of ink properties, and the blotter card will prevent other pages from getting ink on them if you close your notebook. I very much like the layout, and the 100% recycled paper performed surprisingly well. The ink on the page is vegetable-based ink for a "greener" production process. For the money, these are fantastic, clever little notebooks, and I look forward to seeing if Tom puts out some regular notebooks on this paper. I love my other notebooks that are of comparable design, but they just cannot handle fountain pen ink very well, even if the ink is designed for cheaper papers. This A.G. Spalding & Bros. fountain pen was sent over to me from Lily, at JetPens (Thank you!). I've looked at these pens for the last few years, always contemplating adding one to my basket, but I had never heard much buzz about these pens, and I was afraid of getting stuck with a $37 pen that I didn't enjoy. After having the opportunity to sample this one, I think I will pick up the A.G Spalding & Bros Mini Fountain Pen, too, primarily because that one is available with a fine point nib. As I noted in the written review, I like how this pen is not merely metal, plastic, acrylic, etc., but that is utilizes wood in the design. This is a very logic design choice for A.G. Spalding & Bros., given that they have been the source of innovative in sports equipment (primarily baseball) for well over a century. The clip is very sturdy and firm, which is unlike some other manufacture's aluminum clips that may easily bend and thus become unattached. You can get this pen with beige maple wood, as shown above, or you can get it with black maple wood, orange maple wood, or in all metal. I like this color the best as it feels the most organic. The end of the pen is a rounded metal knob. It's more interesting then just a flat end, and I like how it is a bit whimsical. If the end were coated in plastic or rubber, it could almost double as a stylus. The nib is a steel nib, which, as far as a I know, is only available in a medium nib. Anything beyond a fine is typically outside of my comfort zone, but this is a true medium and did not meander into the bold line width as some tend to do. 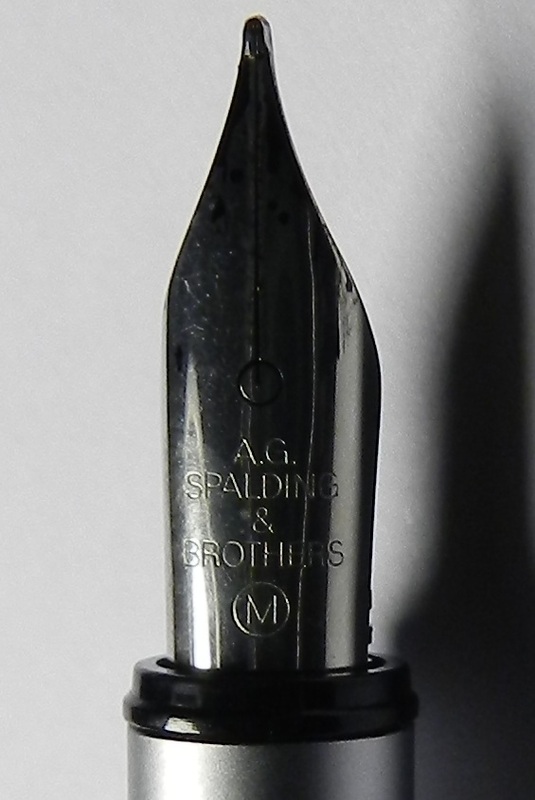 Initially I thought that this pen was manufactured in the U.S. as the cap provides the New York address of A.G. Spalding & Bros., but this pen is actually produced in Japan. More often than not, this is a very good thing in the fountain pen world. Take note that the symbol before 'JAPAN' has a little 'RF' in front of it. Upon further investigation, I found out that this is the symbol for RayMay, a company in Japan that is licensed to produce the A.G. Spalding & Bros. stationary items. "RayMay Fujii Corporation was founded in 1890 in Kyushu, Japan. After World War II, the company branched out to Osaka and Tokyo to start its stationery business. RayMay (Rei Mei 黎明 means "daybreak") the name is meant to express the company's vision for a "new spirit in daybreak". RayMay has the license the produce the famed A.G. Spalding branded stationery items." So, I popped in the included black ink cartridge (not sure who actually makes the ink), but the writing experience was delightful. Above you can see that the line width of the medium nib is not arbitrary, though I was surprised to find that the line width of TWSBI Extra Fine was about the same as the Pilot Cavalier Fine, but I digress. My next step is to get a converter for this pen as I have a stronger need to use up my bottled ink than buying additional short international cartridges. You can apparently use the Pelikan C499 converter in here, or you can stick with the cartridges if that is more convenient. The June Carnival is up at Ethereal Voices - Go check it out! ViVO generously sent me a few different samples to review, and I decided to start with the ViVO Ultra Ballpoint. It's hard to defend too much about this pen given the cost. I'd say that this pen would be much better at a lower price point, but the Bic Atlantis is smoother, more consistent, and far less expensive. If you like going with a company that is not one of the big names, or if you want a larger, more ergonomic barrel, then this might be something worth trying. The cap has little vents which kind of remind me of shark gills. The paint on one of my samples was chipped on the conical point section. I was assured this is extremely rare for this to occur, but it was certainly evident on my sample. Here is a comparison of a Bic Atlantis to the ViVO. As you can see, it is difficult to justify the extra money when a Bic is superior. Well, there you have it. Your results may vary, but I didn't like this one. In defense of ViVO, the liquid roller and gel are much better, and I will be reviewing those soon, too. My notebook collection made it onto Notebook Addict of the Week at Notebook Stories. What an honor! If you are not familiar with Nifty, of Notebook Stories, she is also the creator of the monthly Carnival of Pen, Pencil and Paper. The next Carnival is just around the corner, so be sure to get your submissions in using this link.